Irish rental yields imply dysfunctional housing market. Irish economy grew by 6.7% in 2018 but slowed sharply in final quarter. Has Irish Unemployment hit its cycle low? Irish rents boosted by mortgage controls and investor demand. According to the 2016 census around 1 in 5 of Irish households were in private rented accommodatiom, against under 10% a decade earlier, with the actual numbers more than doubling to over 300,000. 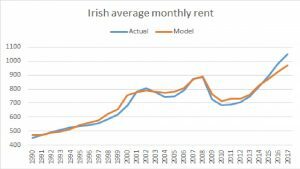 Over that period the average monthly rent paid fell by over 20% between 2008 and 2011 before recovering strongly and then pushing to new highs; the 2017 average was €1050 and this year will probably be around €1120 ( the rent actually paid, used here, differs from the asking rent on new lets). What determines the level of rent? It is generally argued that rents, unlike house prices, are not prone to speculative bubbles, largely because leverage is not involved, and the market is competitive, with a large number of individual renters. So real factors are likely to dominate and in our own rental model two are key. Employment appears to be a big driver of the demand for rental property while the main factor acting to dampen rental growth is the change in the housing stock relative to the population. Consequently, the persistent upward move in rents over recent years is readily explainable, given a backdrop of surging employment and weak house completions, the latter proving too low to prevent the housing stock per head from falling. 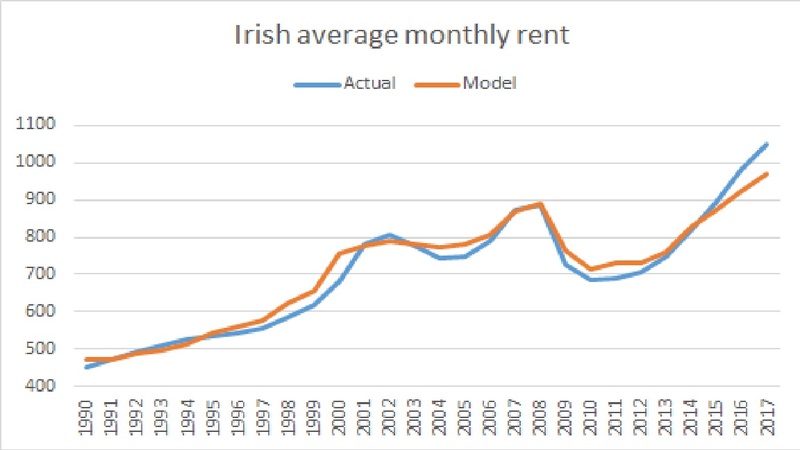 As can be seen in the chart, our model tracks actual rents very well, although over the last three years the model is underpredicting, by up to 10% in 2018, which implies something else is at play supporting rental values, particularly as there are now controls on existing rents in the major cities.. In our view there are two factors which together are pushing rents above where they might be given employment levels and housing supply. The first is the Central Bank’s mortgage controls, which were first introduced in 2015 and modified since. The most recent change came into effect this year and reduced the number of mortgages for first time buyers that can exceed the 3.5 LTI limit to 20% from the 25% that had been drawn down in 2017. Income is the key constraint for this segment of the market and the number of mortgage approvals for FTBs fell in the first half of 2018 relative to the final six months of last year. In other words, would be buyers that might have secured a mortgage on the previous criterion are still renting. In addition, the combination of high rental yields and low returns on traditional lower risk assets ( influenced by QE) have spurred huge investor interest in the Irish rental market, from Reits, pension funds, foreign investment funds and individuals- a third of transactions this year are to non-household buyers or an individual not occupying the property and that share has been above 30% since late 2013. The rental market will eventually cool as the supply of housing increases ( or if there is an employment shock) but rents appear to be higher than the fundamentals dictate as would- be house buyers have to compete with investors seeking relatively high yields and are also constrained by controls on leverage.